Make copycat Chilis salsa today. Making Chilis salsa isn’t hard to do. Now you can make your own version of Chilis Salsa at home. 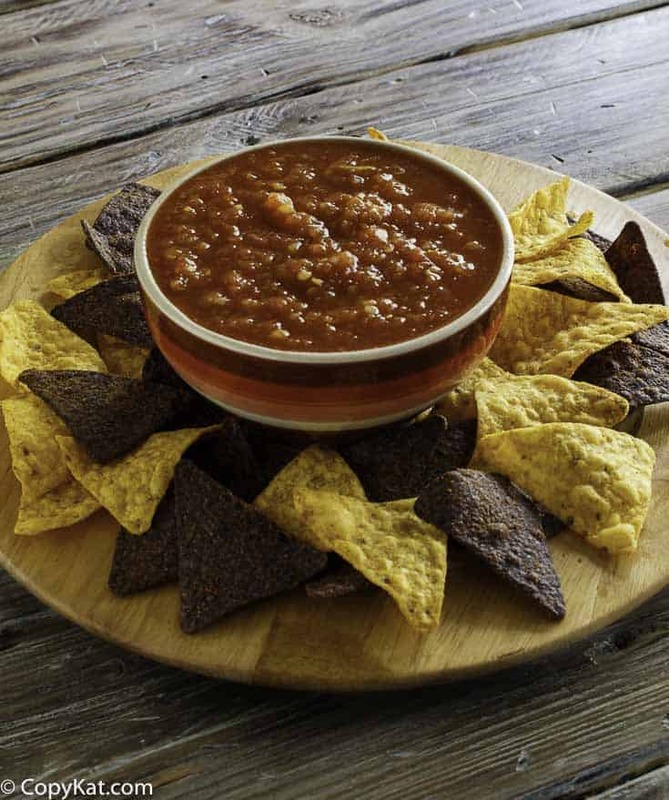 You can make salsa just like Chili’s with our recipe. Canned tomatoes and canned green chiles make preparing this salsa easy. A couple of hours of chilling will help blend and enrich the flavors. Chilis salsa is so easy to make. You never have to worry about being without a jar of salsa again, because you will always be able to whip up a batch of homemade salsa that tastes great. You can also customize this recipe to your personal liking if you want more garlic, you can add more garlic. What I also love about this recipe is that by using canned ingredients you can have this salsa any time of year. So why not whip up a batch of this great tasting Chilis salsa today? This salsa can be made quickly in no time at all. You will most likely spend more time assembling your ingredients than you will be making this salsa. I personally love to add a little extra fresh garlic to my salsa, but that is just me. This will stay fresh in your refrigerator for about 3 to 5 days. 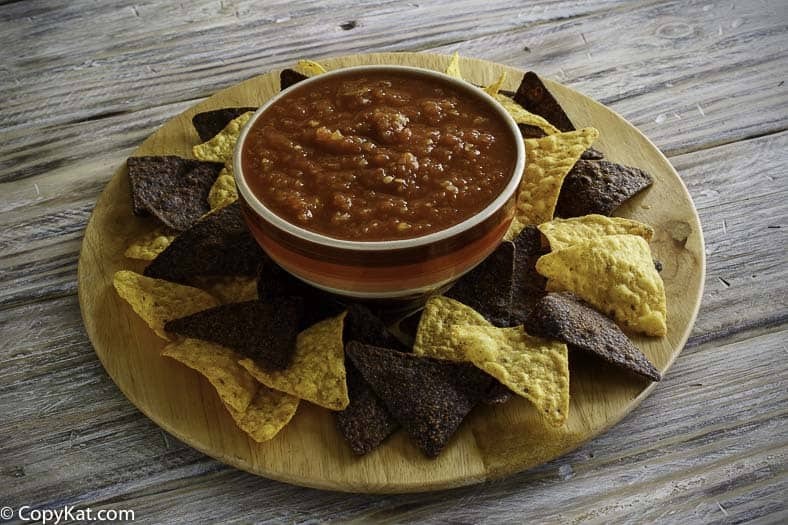 You can recreate Chilis Salsa in no time at all with this easy copycat recipe. 14.5 ounces diced tomatoes with green chilies "Rotel"
lace the jalapeños and onions in a food processor. Process for just a few seconds. Add both cans of tomatoes, the garlic salt, cumin, and sugar. Process until everything is well blended, but do not puree. Place in a container, cover, and chill well before serving. I was thinking maybe Campbell’s condensed tomato soup ! Or mayby the sell a different brand of condensed soup? I just spent hours making salsa. Yes, I did can it. Then I remembered how much I love Chili’s salsa. I looked it up and there was the recipe. So simple and so easy to make. Thank you for the recipe. I just had chips and salsa last week at Chili’s. So very good. And since you can take an extra bag home with salsa, found me munching on them at 11:00 at night. The secret in my opinion was adding a half cup of dill pickle juice to the mix as well as lime and cilantro. I coukd see vinegar doing similar but the dill is most likely part of Chilis spice pack. After 40 years cooking I can safely say I taste dill pickle flavor in Chilis salsa. My wife swears not only is mine like Chilis it’s a bit better. Thanks for the tip! I’ve tried many Chili’s salsa copycat recipes and adding a little dill pickle juice is definitely what it needed. This is better than any salsa I’ve ever had and Chili’s has always been my favorite. I tried it for the first time. I added cilantro and lime juice. It was so delicious that I could drink it!!!! I make this base recipe ….a lot and in huge batches because when I take it people cant get enough. but I tweak it! I use a lot of extra sugar and a lot of cilantro. I add pickled jalapeños to taste. its a sweet hot flavor..